Yesterday the weather turned for the worse and dropped several degrees as air from the arctic blew down the country. It was a bit of a shock to the system but now the weather is more seasonal. For me cold weather means cold smoking. To avoid bacteria and other problems with food spoiling, I avoid using my smoker during warmer months especially as it is located in my greenhouse. 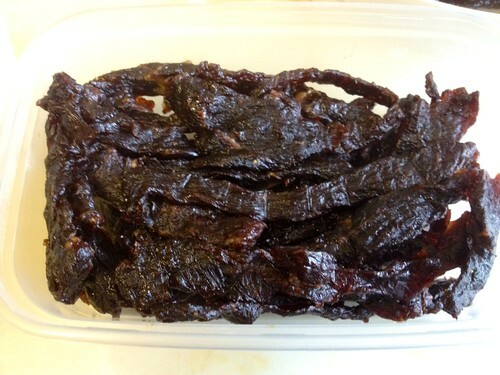 I am relatively new to smoking food and have only been using my cold smoker for a year, however, armed with great advise from people online, I’ve produced some very tasty smoked food like this beef jerky. Two pieces of lean steak (frying, rump, sirloin, fillet are all ok but will result in varying degrees of toughness, I am using rump). 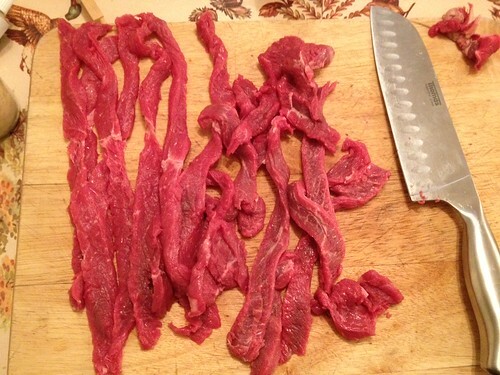 Using a sharp knife (I use my santoku) slice the meat into thin strips around 2-4mm in thickness. If you cut across the grain, the meat will be easier to chew. 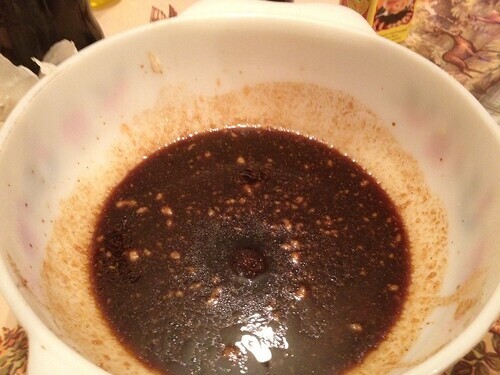 Combine all of the other ingredients in a large bowl (large enough to contain the meat). Add more tabasco if you like a hotter flavour or more sugar if you like a sweeter jerky. 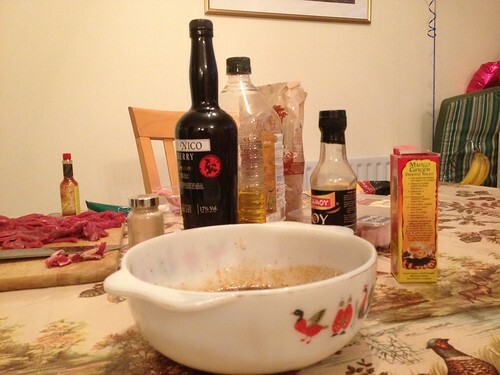 Coat the meat thoroughly with the marinade and cover with cling film. Place in a fridge for a few hours, perferably over night – the longer you marinade, the better the meat will take on of the flavour. 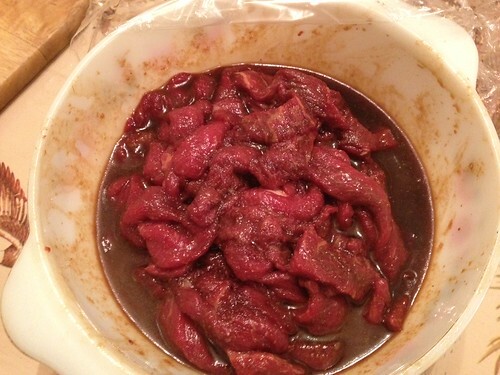 Once the meat has marinaded, it will have taken on the colour as well as the flavour of the marinade. Place the strips of meat on your rack, gently shaking off any excess liquid. Produce a small stream of smoke which will last around three hours. 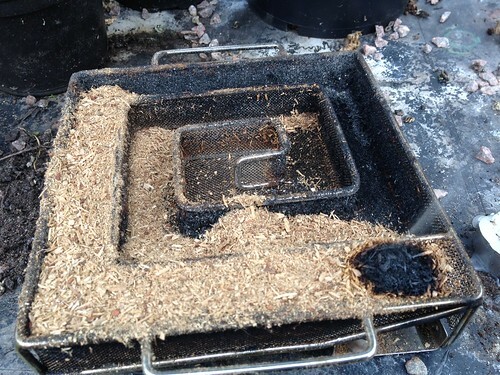 I use the ProQ Cold Smoke Generator and fill two lengths of it with an oak sawdust. 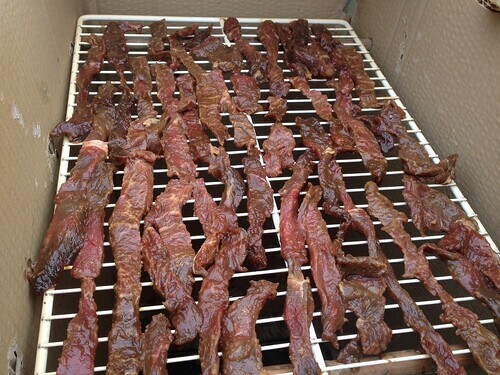 After the smoking session, the meat will be ready for dehydrating. 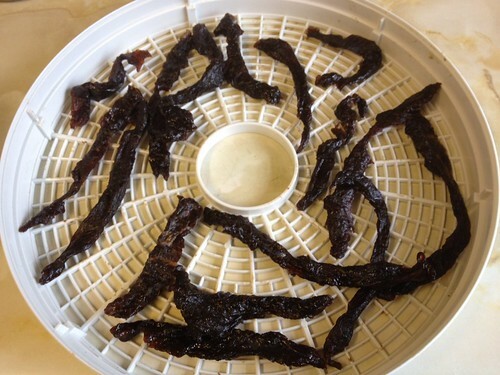 I use a basic dehydrator and it usually takes 4-5 hours to dry the meat. Once the jerky is ready, it will have taken on a very dark hue and will look shrivelled and glossy. 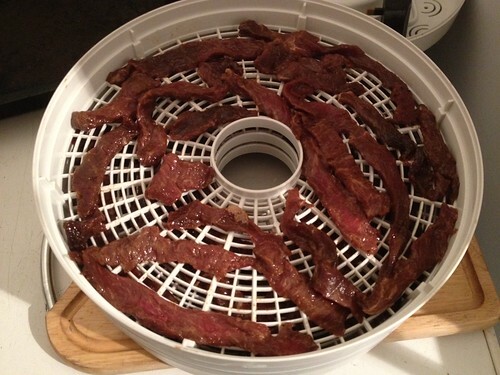 Turn off the dehydrator and allow the meat to cool to room temperature. I place mine in an old chinese takeaway container but a tupperware container will be fine. Keep refrigerated and it’ll probably last a long time although in my fridge it’s usually gone within a week. I blame mice or perhaps borrowers.